Your intranet enables people across the organization to network, engage, and share ideas, content, and best practices. 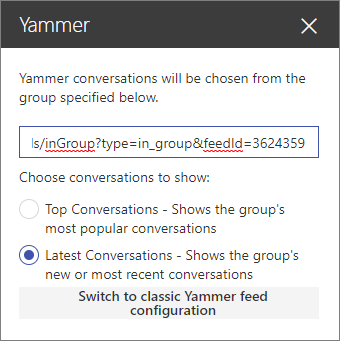 Use the Yammer web part to add Yammer conversations to your SharePoint Online pages, to build communities and foster engagement. To add a page to a SharePoint site, see Add a page to a site. View the most popular or recent conversations, post new messages right from your page, and easily transition between your browser and mobile device. In Yammer, copy the group URL from the browser that you'd like to add to your SharePoint Online page. On the SharePoint Online page, select Edit at the top right of the page. Hover your mouse above or below an existing web part or under the title region, select , and then select the Yammer web part. In the address box, paste the Yammer group URL. Latest Conversations (group conversations that are new to the reader). After you publish, you can create a new post by clicking Post a message. You can also click a post to go to it in the Yammer group, or click View more at the top right of the web part to go to all of the posts in that Yammer group.